Hoping for this as well. You want to use the old god blood for advancements but those tentacled horrors will always seep through and take a familiar shape. I got a feeling David Injecting himself could lead to the final form, as the tubes in these androids are very reminicent of the tubes on the heads and bodies of the aliens, biomechanical is the key word, what would happen if you inject it to a android? like in the Prometheus comic book ? If they go anywhere with it, this is kind of what I'm hoping for too. I honestly don't mind the concept of the black goo being a template for the Aliens as we know them. It also means I'm not too fussed on all these Alien-like creatures as a result of the experimentation and corruption of the accelerant. No thank you! I really really really hate the idea that David is going to be responsible for the final Alien, the Alien as we know it. I'd like it to remain an ancient creature. This is why I don't mind the idea of the goo being an ancient template that the Engineers stumble upon. 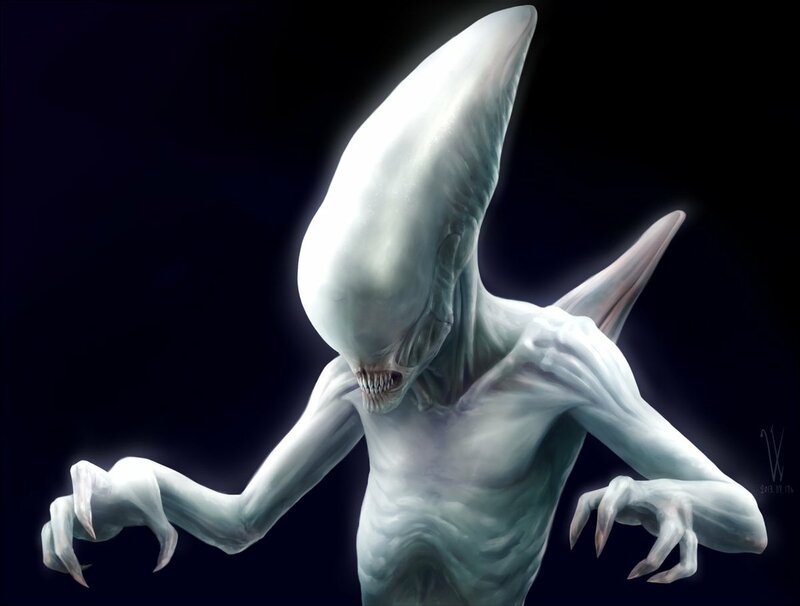 I'm with you Hicks, and I share your dislike for the idea, though I wouldn't be entirely surprised if he has some part to play in the Alien's final form. Altough having said that, the Engineers pressure suits in Prometheus were of a biomechanical nature so perhaps David is not going to be utilised as an essential cog in the Alien's biomechanical aesthetic. It'd really knock them down a peg in my opinion. It work works better that they're this ancient force of destruction. I don't see it transpiring that way, Ridley mentioned a 'when' in regard to the creation of the xeno, so I think if it comes from the primordial ooze and left to evolve on a planet I'd be fine with that. The black goo creates creatures that create other creatures like the Deacon. the question then was "who made them"
they stole the goo from the creators and try to experiment etc. They are jealous of us and thats why they tried to wipe us out, they see us as inferior, and it think they want to be the only ones. So im wondering as for the big bald head statue in the urn room, is in fact an image of the engineer race or is it a image of the real first creator of the engineer race the human race and the xeno/black goo. Was that creator a humanoid? and is that why the engineers hate us, because we look like the creators and they dont so much. Is the original creator killed by the black goo or the creatures from it, and are the engineers trying to recreate the creators or trying to control the black goo, or is the black goo the blood of the creator? Is there an alternate timeline or time travel gonna be inserted, so David is possibly becoming the creator? Or is the creator and maybe the first human coming from a planet so far away that it took even 2000 years in lightspeed to reach us. To be honest, I'm still hopeful that the original ALIEN movie lifeform...which was a tough sonofabitch with acid for blood...turns out to be something that had 'evolved naturally' that way over time, due to some extremely harsh conditions on it's unknown birthplace. Thing is, Ridley initially intended to move away from ALIEN's original 'xenomorph' design I believe, and seemed to be attempting to give us 'different'-looking creatures instead...so I was hoping that the 'black goo' material was actually some kind of 'by-product' substance from the 'xenomorph's world which the 'Engineer's had come across during their past travels - a substance which they gathered in quantity, as it had some 'transformative' properties which were of great interest to them. f**king A. Great Old Ones. The thing I find interesting about these pictures, if they do indeed show David's Den, indicate that the planet they landed on did not have a highly advanced civilisation there. David is using parchment and charcoal by the looks of it, the stands for the creatures look like roofing slates and bent metal rods and even the 'forceps' look like they came from a Blacksmith's forge. It seems as though David has had to start from scratch, using primitive tools and materials, so I'm wondering what happened to the Juggernaught and it's comprehensive database that the android could have accessed. If the planet's inhabitants suffered some kind of 'alien attack' (as the other spoiler pics indicate) I should imagine that it happened some time ago. This makes me wonder where David is getting his genetic material from for his experiments and judging by the various shapes and sizes of the 'morphs' on display I would imagine that he's working his way through the planet's indigenous rodents and primates. Those skulls in the bowl would appear to belong to some type of monkey-like creature.